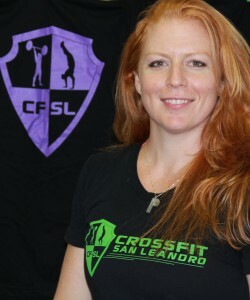 We started CrossFit San Leandro to share with others our love for physical activity and sport. I have been a Physical Therapist since 2002, with special training in manual therapy and orthopedics. My first experience with CrossFit was in 2007. My background prior to that included basketball, volleyball, triathlon, and general weightlifting. As I became more familiar with the CrossFit training methods, I fell more in love. The combination of intensity, constant variation, and community was everything I loved about sport and fitness. Not to mention, it delivered results like I had never experienced. Now I have the joy of showing others how they too can achieve their goals and do things they never thought possible. I am constantly growing my knowledge through continuing education courses and training with some of the best coaches in the sport of Olympic weightlifting to ensure our program delivers the best training available. I am available for private Olympic Weightlifting coaching, and post-injury or surgery programming. Programming for people recovering from an injury or surgery is one of my specialties and passions. Please email info@crossfitsl.net if you have questions.